The future of healthcare technology is full of applications that value motion tracking and localization measurement. The latest advancements now allow for instantaneous feedback from high accuracy, embeddable, sensors that do not require line-of-sight in order to track continuously. Tiny magnetic sensors are now available for use in countless procedures requiring medium to very high accuracy (VHA) performance while installed inside catheter-sized instruments and one-time use devices. Limitless possibilities—synchronize CT or MRI images with the patient’s actual position, monitor respiratory gaiting and other real-time movements with our latest tracking capabilities for motion measurement and precise localization. We value partnerships that achieve collective advancements in healthcare and are proud to offer our tracking technology in both OEM custom packaging as well as off-the-shelf product lines. Our motion trackers have a wide variety of uses in healthcare applications, including: ultrasound simulators, training and simulation for surgery, clinical applications, EEG localization, laser ablation, and more. Polhemus trackers are also used in the rehabilitation and physical therapy market, combining state-of-the-art techniques with virtual reality technology. Our sensors are embeddable, and our motion trackers are the preferred choice for leaders in healthcare simulation. 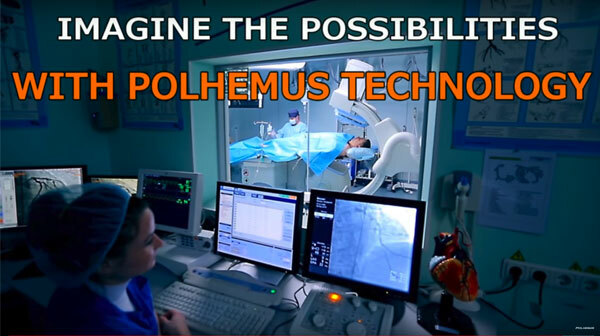 Below is a sample of applications that use Polhemus technology relevant to the healthcare market. With over 40 years of experience, our customer and partner list is long; below is a sample of a few of our valued customers. Polhemus trackers have a “tracking hemispheres” capability that allows totally spherical coverage around the source. This gives customers tremendous set-up flexibility.